courtesy ArtisanBreadInFive.com. Halloween is a week away. Are your mummy ducks in order? Halloween is great fun for kids, but adults enjoy fun food too. These crunchy breadsticks combine the ghoulish with the delicious. You can make them as is, or add a few drops of green food color to the dough if you want your witch to have green-tinted flesh. The recipe is courtesy of Jeff Hertzberg and Zoë François, baking partners who have written several books that make bread-baking easier for anyone who wants to pull fresh loaves from the oven. Why not serve the breadsticks with a bowl of “bloody worm” pasta: maloreddus pasta with tomato sauce? 1. PREHEAT oven to 450°F. There is no need for a stone. 2. DIVIDE the 8-ounce ball of dough into 8 equal pieces. Elongate the pieces into ropes. 3. TWIST the ropes so there is a knot in the middle; this will look like a gnarly knuckle when they are baked. 4. GREASE a baking sheet and arrange the breadsticks at least an inch apart. Let them rest for 20 minutes. 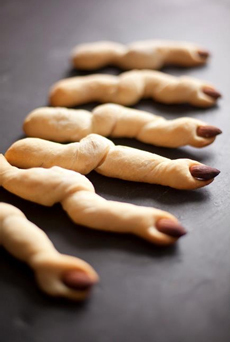 Right before baking, press the almond “fingernail” into the end of each breadstick. Be sure to press hard, so they won’t pop off while baking. Here are photos of the whole process. Get the book and preheat the oven. Photo courtesy Thomas Dunne Books. BAKE FRESH BREAD EVERY DAY! Jeff Hertzberg and Zoë François know that people want to bake their own bread, so long as they can do it easily and quickly. 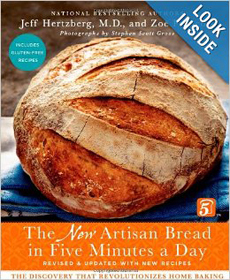 Their revised classic enables you to do just that: “The New Artisan Bread in Five Minutes a Day: The Discovery That Revolutionizes Home Baking,” by Jeff Hertzberg, Zoë François and Stephen Scott Gross. You can read a nice chunk of the book via the “Look Inside” feature on Amazon.com, and can pursue the authors’ blog for more recipes.